Linda is often asked this question about her patterns. The answer involves the wearing of many hats! This lecture describes how an idea develops, and how it becomes a pattern. Summary: It all starts with the daydreamer, playfully sketching with pencil on graph paper. Most designs only make it that far! If a design is chosen for further exploration, the mathematician comes out to play. Once the mathematician is satisfied, the artist goes to work with her palette of fabrics. Thank goodness for the fabric stasher, who has collected so many. (Sometimes the shopper has to be summoned.) Finally the quilter gets to participate by making a sample. The teacher writes up instructions and teaches a class, many quilters test the pattern, and then the editorial/publishing team goes to work. Patterns are one thing, but a specialized tool? How did THAT come about? Learn the story behind this popular new tool that allows quilters to machine piece perfect circles easily and accurately. Includes a demonstration of how the tool works and a trunk show of quilts made with The Learning Curve. We all know the trick of choosing a "focus fabric" and selecting coordinating fabrics that match the colors in the focus fabric. As Dr Phil says, "How's that workin' for ya?" It works fine for a pattern calling for 3 or 4 fabrics, but what if you want to make a quilt with fat quarters or scraps? What if you want your quilt to look more dimensional? This lecture includes many practical pearls you can take home and use to take your quilts to the next level. Learn to use The Learning Curve Ruler for adding circles to your machine-pieced quilts. Bring your sewing supplies and some fat quarters, and learn how to use the TLC ruler to make the units that create perfect circles in your machine pieced quilts. Level: Beginner and up. Half day (3 hr) or full day (6 hr). 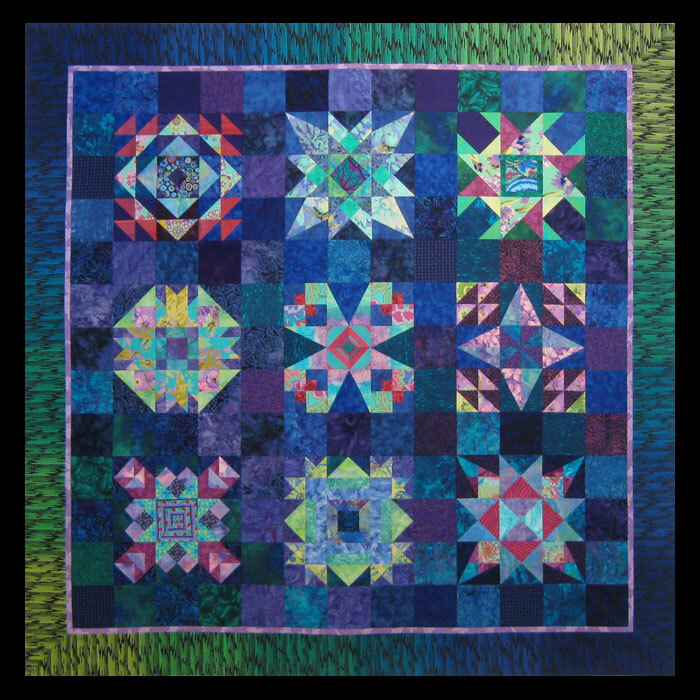 This workshop covers all the same skills as The Learning Curve Workshop, while focusing on a quilt project, "Over the Moon." See "Quilt Top Workshops" below. Full day (6 hr). Choose any one quilt pattern from the "Products" page. Each participant works at her own pace to learn the skills needed to make a beautiful quilt. Linda gives everyone the one-on-one attention they need to master the techniques and build confidence, while having fun. Includes tips and tricks to take the stress out of accurate piecing. Most popular: Turbulence, Pyramid Scheme, Over the Moon. Level: Advanced beginner and up (i.e. participants have made at least a quilt top or two). Full day (6 hr). Do you see what I see? Learn some new ways to see. This workshop will help you develop an eye for fabric combinations that work. Would you expect to pick up a violin and be able to instantly play a song? Of course not! So give yourself permission and time to develop your design abilities. It takes practice. Learn some tricks and techniques to use at home to hone those skills. Half day (3 hr). Wynter Haven Quilt Studio, Queensbury, NY. - "Dotty": Thursday, July 26th and August 9th, 1:00-4:00pm. Learn how to use The Learning Curve to machine piece the perfect circles in this fun quilt top. Fat quarter friendly. Visit Wynter Haven for details and registration. May 3, 2014 TBA Workshop, 9am-3pm. "A World of Quilts" Quilt Show, Northern Star Quilters' Guild, Danbury, CT. May 5-6, 2018. Vending. Wynter Haven Quilt Studio The Learning Curve: Methods 1&4. Queensbury, NY. Thursday, May 17, 1:00-4:00. Wynter Haven Quilt Studio The Learning Curve: Methods 3&6. Queensbury, NY. Thursday, June 21, 1:00-4:00. Adirondack Quilt Camp "Over the Moon" Quilt Top. Long Lake, NY. Monday, June 25, 9:00-4:00. Adirondack Quilt Camp "Turbulence" Quilt Top. Long Lake, NY. Tuesday, June 26, 9:00-4:00. FRAGRANCE-FREE: Help provide a safe and comfortable environment for chemically sensitive quilters. Please refrain from wearing hair spray, perfume, and other scented products to classes. Thank you! TO REGISTER FOR CLASSES: To register for any class at a quilt shop or guild, you must contact the shop or guild directly. WHAT TO BRING: There is a supply list specific to each class, which you will receive after registering. To all classes (except "Fearless Fabric Selection"), you should bring your Basic Sewing Supplies (BSS): Sewing machine with extra needles, bobbins, and owner's manual; rotary cutter, rotary cutting ruler(s) and self-healing mat; scissors, seam ripper, straight pins, pencil, fine-point Sharpie. Optional: iron, ironing board, task light. REFUNDS: Refunds are at the discretion of the quilt shop or guild, and you must contact them directly. NOTE TO BEGINNERS: Linda's classes are designed for quilters who have taken classes before, or who have already made a couple simple quilt tops. Most quilt shops offer a good beginning quilt-making class, which is a great way to get started.